The colour purple oozes class and elegance. Purple is a favourite for many women like me. 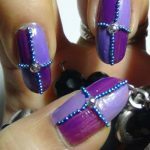 If you like to wear purple outfits for traditional occasions, then you can top it with some purple nail art. Nail art with traditional attire? Taken aback, are you? But one of the two nail arts I will show you here makes a perfect combo with sarees and salwars. You can even wear this design as a bridal nail art! Follow the simple instructions and you can make these designs with ease. So let’s see how to create the first design. Glittery and gorgeous – two words that describe this nail tattoo the best. How To Apply Studded Purple Nail Design? Apply 1 or 2 nice layers of base coat on all the nails. This base coat will prevent nails from chipping or staining. If your nails are especially prone to breakage then this base coat will provide more protection to your nails. 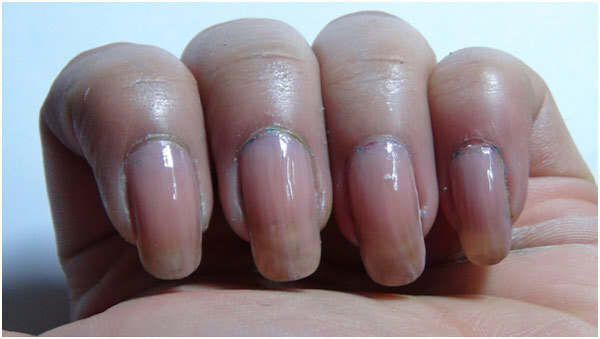 After your base coat is dry enough, put 2 layers of the skin coloured nail polish. This will make the base more opaque. 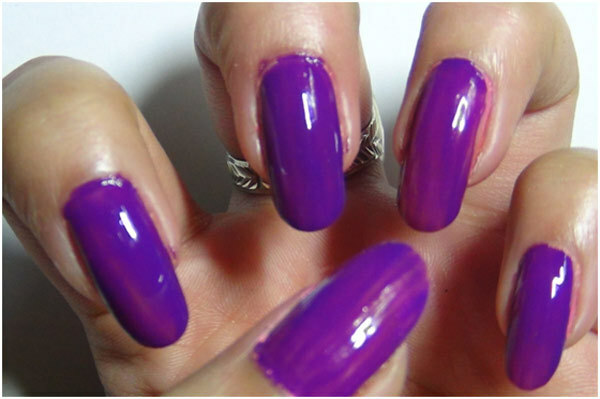 Once the skin coloured nail polish is perfectly dry, put on some nice purple nail paint on all the nails. Let it dry completely before moving on to the next step. Now take some transparent polish or nail art glue and put a dollop on the centre of the nails. Immediately put one rhinestone on it. Do one nail at a time. 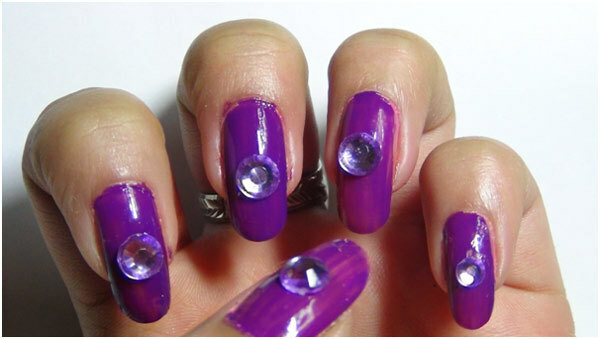 Now use a little transparent nail polish around the rhinestones. Do one nail at a time. Use your toothpick or orange stick to pick caviar beads. Next, stick them on the transparent nail polish surrounding the rhinestones. After all the nails are done, use a nice layer of transparent polish to secure the whole design. 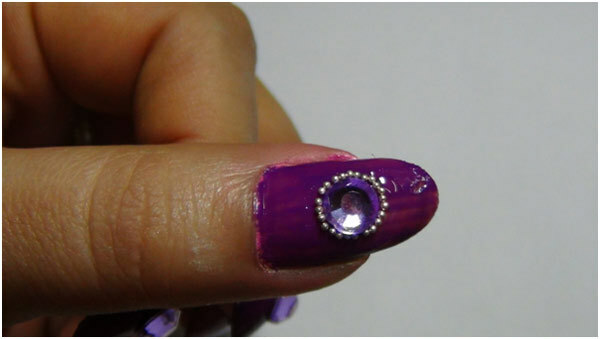 Avoid using transparent nail polish on top of the rhinestones because then their shine may be dampened. Hope u enjoyed this nail art. Loved the purple nails? Now let’s move on to the next one. 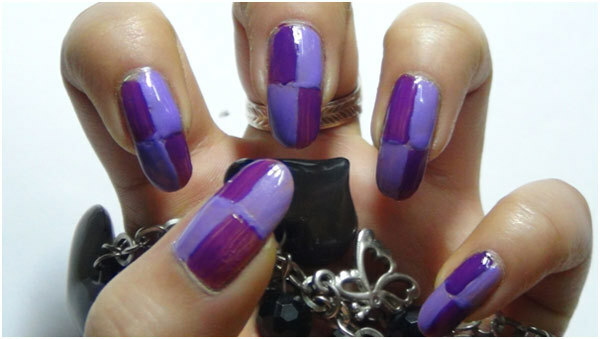 This is a trendier form of purple nail art, which you can wear with your jeans, tops, shirts or even jumpsuits. You can even wear this with your party wear sarees. How To Apply Trendy Duo-Tone Purple Nail Design? Apply base coat. Follow it up with skin coloured nail polish. 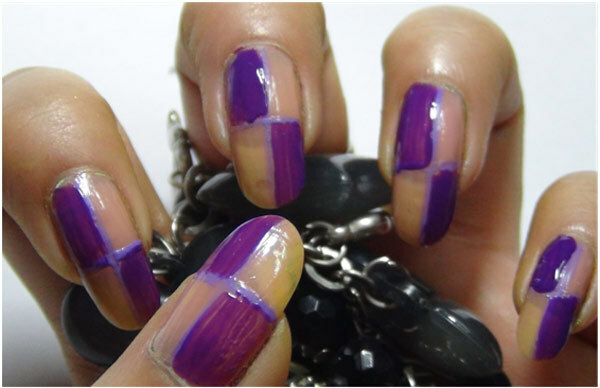 Next, when this is dry, use a nail art brush and your light purple nail polish to draw up demarcations. It should look something like the picture shown above. 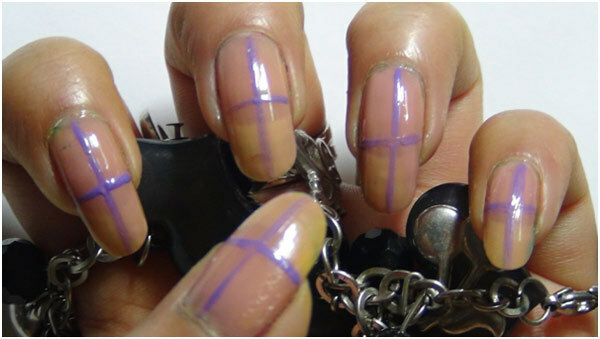 Now apply your dark purple nail polish very carefully on the diagonally opposite spaces. Now do the same with your light purple coloured nail polish. I’ve used the nail polish brush only. Don’t worry if there are little inconsistencies. Let this dry for a few minutes. Now take your transparent nail polish and use a small dollop in the centre of each nail. Place the stones. You can take the help of a pair of tweezers to do this. Then, place the caviar beads. Do one nail at a time. Use transparent nail polish on the nails at the demarcations. Take the toothpick or orange stick and place the caviar beads at the demarcations. It should look something like this image. When all the nails are done, cover the design with a top coat. So you see, nail art and traditional wear do get along pretty well. 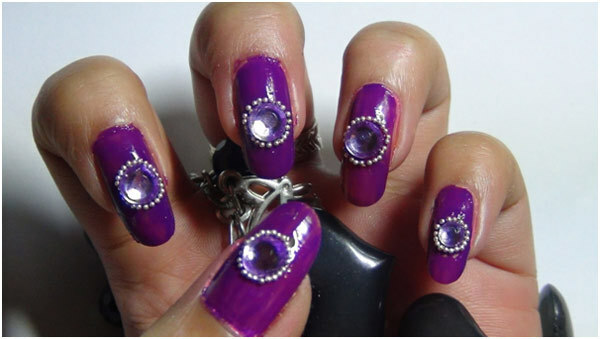 Try these purple nail art designs, and embellish your look to look like a diva!